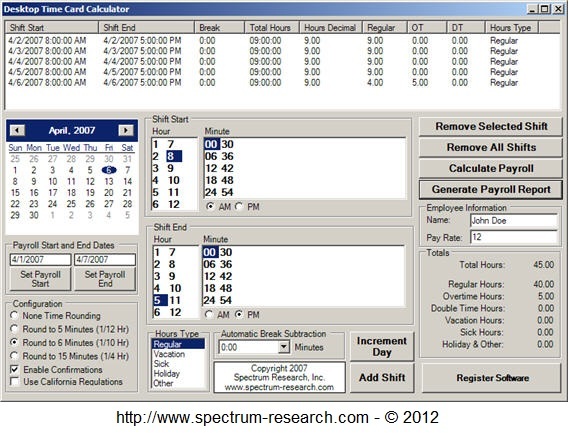 The Spectrum Time Card Calculator (STCC) is our PC time card calculator software program. This program is ideal for companies that don't need the power of our web based Spectrum TimeClock, service, but still need a PC program to accurately add up their employee time cards. It understands how to figure overtime as FLSA regulations specify for weekly, biweekly, and semi-monthly payroll. Now you don't have to be a rocket scientist to figure California employee payroll! It understands how to calculate California overtime, double time, and supports the California 7th day rule. Click Time Card Calculator Video to see how it works. Read the online user manual to see how to calculate a time card. Specify the first day of the workweek. Specify the start and end date of a payroll period. Specify no time rounding, or rounding to the nearest 5, 6, or 15 minutes. Specify the type of hours: Regular work hours, vacation, sick, holiday, or other. Specify that an automatic break be subtracted. Specify that California overtime, double time, and 7th day regulations be followed. 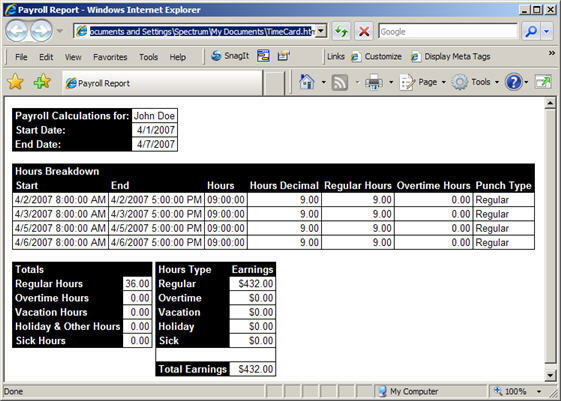 Generates a html time card payroll report from your time sheet calculations that can be printed or saved to disk. Supports calculation of weekly and biweekly payroll. Does not use or require a database. The Spectrum Time Card Calculator is designed to run on Microsoft Windows 2000, XP, Vista and Windows 7. It may be necessary to install the .NET Framework on Windows 2000 and Windows XP. The .NET Framework comes pre-installed on Microsoft Windows XP, SP2 and newer computers. The program must be installed on a workstation's internal hard disk, and can not be run across a network. This product is delivered by email using a .ZIP file. Please make sure you specify an email address that can receive .ZIP files. Orders are processed within 24-48 hours on weekday evenings. Technical support for this product is available by email only.